A new app from an independent Android developer may just have the answer to a problem that we’ve all experienced since games began to become truly mobile. With gamers now being able to take part in their favorite pass-time across multiple devices – smartphones and tablets spring to mind initially – the issue of keeping our saved games in sync is a very real one. So far nobody has really found a proper way of getting around the issue of having our various devices all sing from the same hymn sheet. A new app may have found a way to do just that. 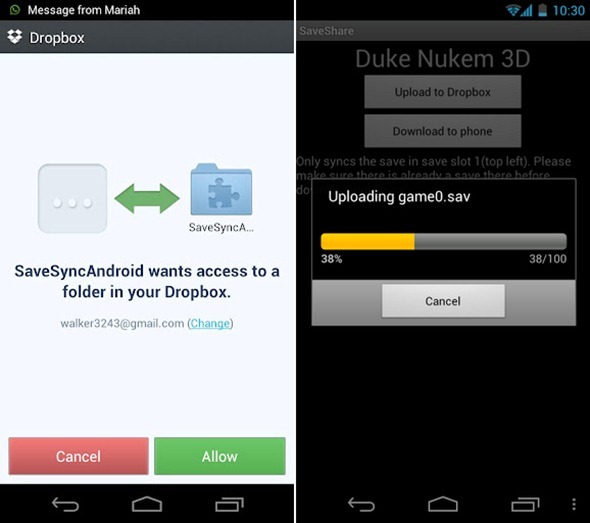 SaveShare by WalkerApps promises to keep your game save files synchronized across all your Android devices, be they smartphones, tablets, media players or anything else for that matter. The files are stored in the magical Dropbox, which means you also have an accessible backup of everything, too. 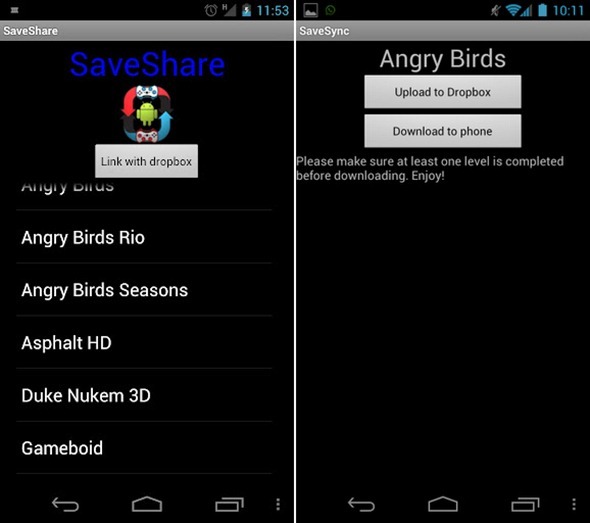 SaveShare allows you to sync your game save progress between all of your Android devices. You can play a game on your phone(or any Android device) and then pick up your tablet and carry on right where you left off! Many top games and even emulators are supported! The app itself will need to support your game of choice in order to work, with more games and a visual redesign slated for an upcoming app update according to its developer. Currently supported games include Angry Birds, Asphalt 6 HD, Duke Nukem 3D, World of Goo and Grand Theft Auto III. Angry Birds support alone has to be worth the price of admission for us! We haven’t tried SaveShare ourselves, but judging by the reviews on the Android Market, the app appears to be well received all around. Those concerned about security need not worry, either, with the app not requiring root access in order to function. If you’re a big Android gamer then this is one app that you’ll want to check out, and at the low price of admission we don’t see any reason not to jump right in. This feels like a feature that really should be in there at the OS level, and with iCloud set to offer similar functionality for iPhone and iPad users, it’s only a matter of time before Google joins in. Until then, SaveShare seems to be a real option for those currently juggling game saves. And for just $0.93, its not a bad deal either now is it?